On February 24th the Duke and Duchess of Sussex visited two of the Education For All boarding houses in Morocco. This was a day of great excitement for the girls, the house mothers and everyone else associated with Education For All. Dressed in traditional Berber clothes some of the girls sang to welcome Harry and Meghan, they were offered delicious Moroccan cakes and pastries, and one girl was chosen to paint a henna tattoo on Meghan’s hand, a traditional practice for pregnant women in Morocco, to bless the mother and baby and prevent harm coming to them during labour. The royal visitors were shown round the houses and spent some time sitting with and talking to the girls and the staff who look after them. 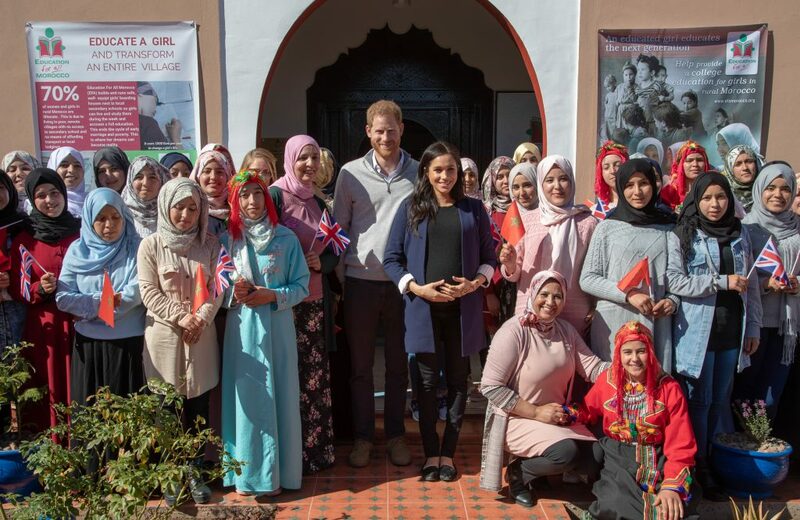 Girls’ education is close to the heart of Meghan in particular, and she and Harry expressed their admiration for a project which has done so much to give 300 girls (so far) from remote rural areas of Morocco the chance of an education.